Still from Wooden Face of Totonicapan, via Ephemeral Films. "“Wooden Face of Totonicapan” is a  color film covering the art of making wooden masks in Totonicapan, Guatemala. The film was made under the auspices of the "Good Neighbor" film project, run by the Office of the Co-Ordinator of Inter-American Affairs in New York as part of the WWII war effort. It was produced by Ralph E. Gray." Periscope Film. This film is part of the "Guatemala Sketchbook" series produced by Ralph E. Gray for the Office of the Coordinator of Inter-American Affairs. The other films completing the series are The Hill Towns of Guatemala and High Spots of a High Country. "The film opens with residents preparing for an annual festival and carefully hand-carving masks for the celebration. 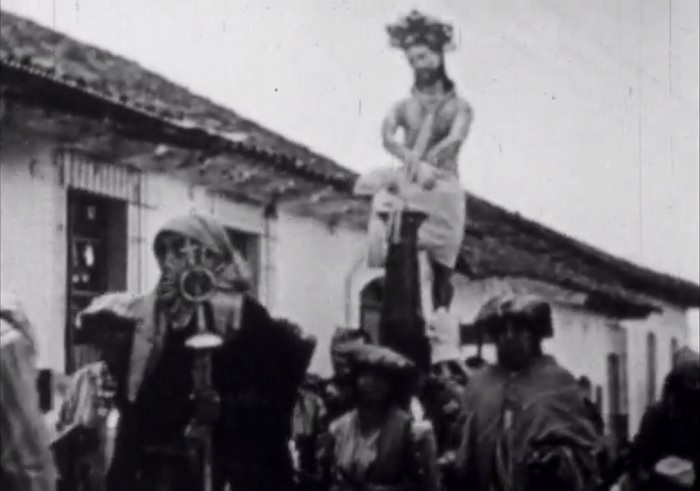 A narrator explains how many of the celebrations are meant to celebration the Christian faith brought to Guatemala centuries earlier by Spaniards, as we see several religious symbols as the focus of parades (mark 01:56) — though some masks are designed to mock the Spaniards who once conquered Guatemala, we are told. At mark 02:34 the audience witnesses another Totonicapan tradition — a bullfight — played out between a bullfighter and a man in an elaborate bull mask. A celebration of the Virgin of Guadalupe follows at mark 03:35 as the narrator again notes the significant role religion plays in the country’s fiestas, followed by a look at the eight-day celebration of the Festival of Santo Tomás in Chichicastenango (mark 04:25) as male worshippers burn incense and climb the steps of the cathedral while the women sit nearby, as is dictated by tradition. The film continues with the narrator providing additional information on the religious significance of some of the celebration and following a procession watch as the faithful return to the church (mark 07:45) where the. head of each family lies prostate in front of the altar and offers prayers." Via Periscope Film.